To join the wait-list for this tour while reserving a tentative spot on our to-be-announced D-Day Tour #2, please send an email request to info@bavariaandbeyond.com. We look forward to announcing an additional D-Day Tour for 2019 in the near future. 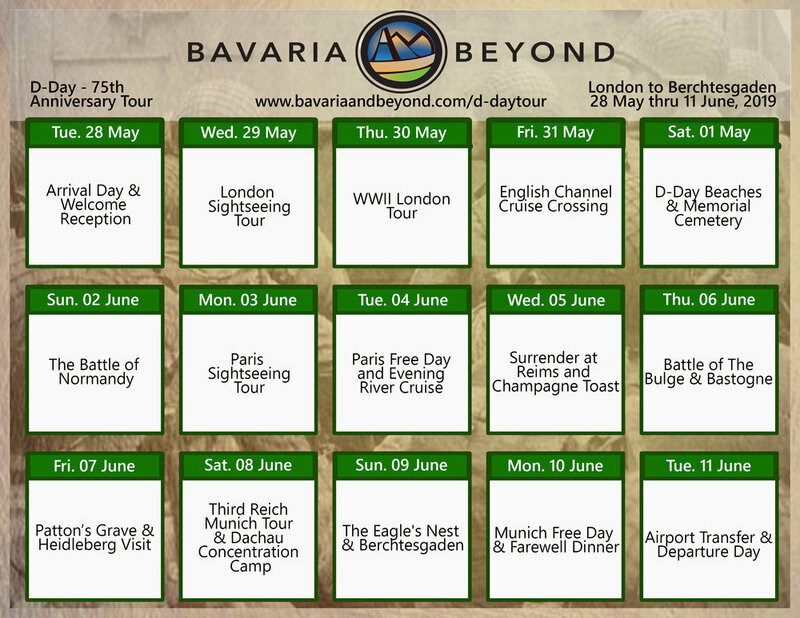 Ensure your spot today by joining our D-Day Tour waitlist by emailing info@bavariaandbeyond.com. Embark on a journey commemorating the 75th Anniversary of D-Day and follow in the footsteps of American and Allied heroes. The sacrifices made in the name of freedom come to life as we visit the beaches and battlefields where history was decided. The 15-day tour is sure to be a moving experience for both avid and casual history buffs alike. Our tour begins in London where Allied Forces assembled in preparation for their D-Day attack. After cruising across the English Channel, we arrive in Normandy discovering the beaches where the future of Europe, and the world, was decided. Following a few days of R&R in the French capital, we travel through champagne country enroute to Bastogne. Along the way, a stop will be made in Reims, France where the German Army surrendered bringing the war against Hitler to a close. A celebratory champagne toast will be made at one of the regions world renowned Champagne houses. From Reims, we move on to the informative Bastogne War Museum where we will discover the history of the decisive "Battle of the Bulge". Passing through Luxembourg we make a stop at the great General Patton’s grave located in the Luxembourg American Cemetery. A visit to Heidelberg will be made as we cross over the Rhein River and into Germany on our way to Munich. While in Munich, we will discover the 3rd Reich history of what Hitler called the “Hauptstadt der Bewegung” or Capital City of the Movement. A day trip will also be made to the infamous Eagles Nest; Hitler's Alpine retreat liberated by Allied Forces in 1945. This tour has the perfect balance of WWII history, cultural insights, and plain old fun ensuring a great time to be had by all. *Single occupancy rooms require a €800 surcharge. Perfectly situated on the banks of the River Thames and directly next to the world-famous Tower Bridge, guest will enjoy being within walking distance of London's biggest attractions. Relax in comfort and enjoy the stunning views after days spent seeing the sights. The Grand Hotel Luxembourg is located in the idyllic Norman town of Bayeux. The town was spared destruction during the Allied Invasion of Normandy and is perfectly situated to visit the many historic D-Day sites. Located a short walk from the Eiffel Tower in the heart of Paris, the Hotel Mercure Paris is ideally located to enjoy your time in the romantic french capital. Enjoy watching the nightly light show of the Eiffel Tower and during the day explore the many cafes and shops in the area. Comfortable four-star accommodations located in the heart of Bastogne. Many restaurants and shops, as well as the 101st Airborne Museum are all located within walking distance of the hotel.